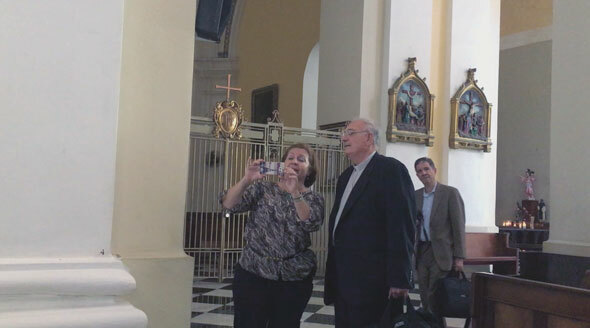 Bishop Nicholas DiMarzio got an up-close tour of the Cathedral in Old San Juan when he visited the island of Puerto Rico recently. In 1980, I visited Southern Italy after the devastating earthquake which destroyed my grandmother’s hometown. While there, I learned a lesson that seems to apply to all natural disasters. That lesson is that people are amazingly resilient no matter what difficulty they experience, even the death of loved ones, and that people have a will to live and rebuild their lives and property as soon as possible. This was evident when I visited Haiti in 2010 following the 7.0 earthquake, and again in Puerto Rico following the most recent Hurricane Maria. People recognize the enormity of natural disasters, while at the same time they recognize the greatness of the human spirit and its resolve not to be overcome, but rather to thrive and survive. Last week’s visit to Puerto Rico confirmed my previous experiences, in that people look forward and not backwards after a natural disaster. People want to rebuild. They want to return to normal. The assistance of others is greatly needed, as it cannot be accomplished by themselves. We know this firsthand, right here in our own Diocese in Brooklyn and Queens with the destruction of Super Storm Sandy. We recognize the help that came not only from FEMA and local governments, but also the private assistance that came through the diocese for victims. In the last several weeks, we have seen three devastating hurricanes and a devastating earthquake. The people of Brooklyn and Queens were asked to contribute to assist those affected by these disasters, within a six-week period. I am very proud of our diocese for – to date – raising just over $500,000 for these disaster zones. Our contributions will be sent to the appropriate entities, just as I was able to personally present to Archbishop Gonzalez the contribution from the faithful of Brooklyn and Queens. One of the needs that arises in natural disasters is the temporary relocation of some residents. This happens for many reasons; some for health reasons and others for situations of complete destruction of housing where even temporary housing is not available, or for other reasons. In the case of Puerto Rico, we see these U.S. citizens coming to the mainland to be housed with friends and relatives with the hope of returning to the Island as soon as the situation improves. The United States of America has a section in its immigration law called Temporary Protection Status (TPS). This is meant to assist those who are in the United States at the time of a natural disaster in their homeland allowing them to have legal status while they are waiting to return home. This has been the case for Haiti, Honduras and El Salvador, countries that have experienced either a natural disaster or lingering civil wars. Unfortunately, the present Administration is about to cancel the legal status of these aliens putting them in an undocumented position. Recently, the U.S. Conference of Catholic Bishops sent two delegations, one to Haiti and the other to Honduras, El Salvador and Guatemala, to verify the conditions regarding a safe return of migrants. In early September, Archbishop Thomas Wenski of Miami traveled to Haiti for such a visit. I was slated to join him on this trip. However, this trip coincided with our diocesan pilgrimage to Fatima and Lourdes. More recently, Bishop Joe Vasquez of Austin joined Bishop David O’Connell of Los Angeles on a journey to the other affected countries. All of the Bishops came back to the U.S. with the understanding that it is not feasible at this time for the 325,000 recipients of TPS to safely return to their home countries. A more orderly process of return as conditions improve is needed for these countries. The fact is, as research done by the Center for Migration Studies has shown, most of these residents are integrated to our society; they hold jobs, and many hold mortgages on homes they have purchased. Having them return after living in the U.S. for an average of around 20 years, in the case of El Salvadorans and Hondurans, and 16 years for Haitians, does not well serve our national interest or our economy. Our advocacy with our elected officials is necessary, reminding them of our country’s reputation as being a place for refuge and liberty, not only for those facing political persecution, but also for those fleeing natural disasters. The United States has always been a beacon of hope to migrants, immigrants and refugees. Each migrant puts out into the deep, seeking new life, protection and better opportunities. Certainly, it would be sad if the United States were to reject our historical position as one of the few beacons of hope among nations that allows those fleeing adverse conditions to make a home among us. We must do what we can by our advocacy and by reexamining our position on assistance to those experiencing natural disasters, especially foreign residents stranded and unable to safely return to their home countries without great difficulty.